The natural alkalinity of cement paste in concrete results in a protective oxide coating on steel reinforcement that prevents the steel from rusting. When carbon dioxide (CO2) in the air penetrates into concrete, it reacts with the calcium hydroxide (CaOH2) in the cement paste producing calcium carbonate (CaCO3). This reaction is called carbonation, and it causes the alkalinity of the paste to decrease, that is, the pH decreases below its normal value of about 13. When the pH drops below 9, the protective oxide coating is destroyed and, in the presence of moisture and oxygen, the steel will corrode. 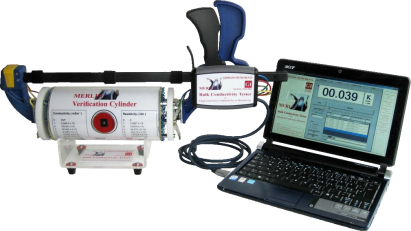 Thus measurement of the depth of carbonation is an essential step for corrosion evaluation of a reinforced concrete structure. 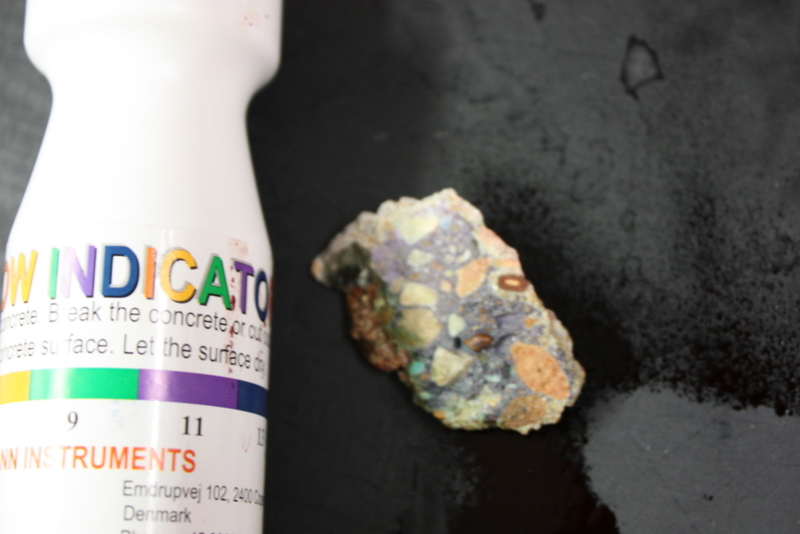 To measure the pH of the cement paste, a freshly broken piece of concrete or a newly cut core is sprayed with the indicator, and allowed to dry. The approximate pH of the paste is indicated by colors as illustrated below. 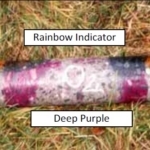 The carbonation front measured with the Deep Purple Indicator represents where the cement paste has a pH within the range of 8.5 to 9.5 as shown above. 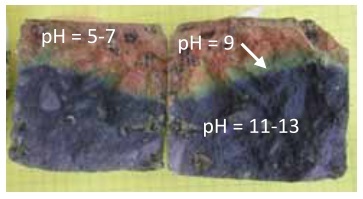 The results indicated that the depth of carbonation determined from thin section analysis correlated with the depth where the Rainbow Indicator indicated a green color or pH of 9 as shown above. 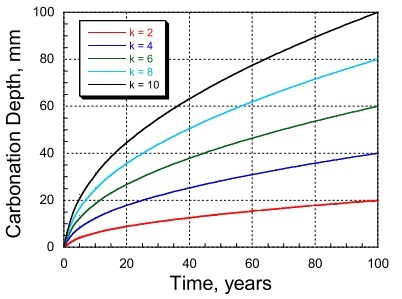 On normal concrete, the depth of the carbonation front can be determined with an accuracy of ± 10 % to ± 15 %. 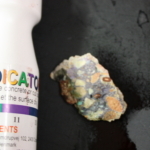 The depth of carbonation evaluated by spraying the surfaces of a freshly broken core with the Rainbow Indicator. Depth of carbonation varied from 27 mm to 41 mm. 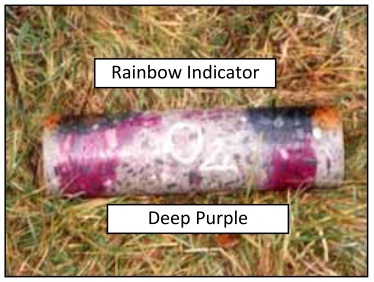 Shown in the photo to the left, the pH profile of a newly cut core was evaluated by the Rainbow Indicator (top of core) and by the Deep Purple Indicator (bottom of core). The core was drilled through the exterior beam of a bridge. Both indicators show that the depth of carbonation was greater on the right side of the core. The left side of the core was the exterior face of the beam, which was exposed to the weather. 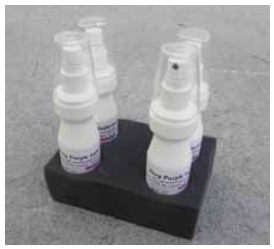 The right side of the core is the interior surface of the beam, where the environmental conditions were more favorable for diffusion of carbon dioxide and resulted in greater penetration of the carbonation front. 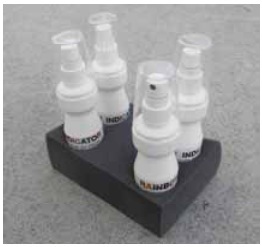 The penetration of the carbonation front depends on several factors, such as the penetrability characteristics of the concrete, the in-place moisture content, and the C02 concentration in the environment. 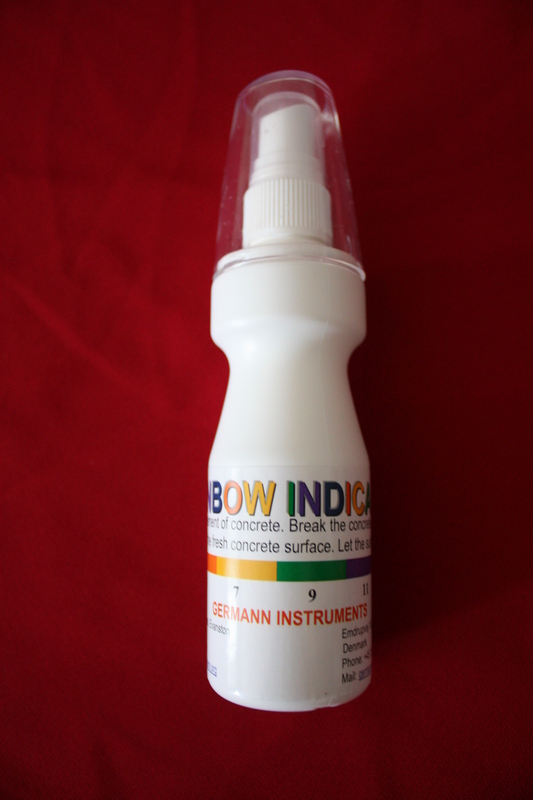 Penetration is slow in dry and wet concrete, and is greatest when the concrete has an internal relative humidity between 50 and 75 %. 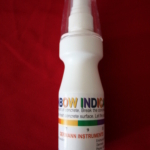 For a given concrete and constant exposure conditions, the depth of penetration. dc, varies approximately with the square root of time.